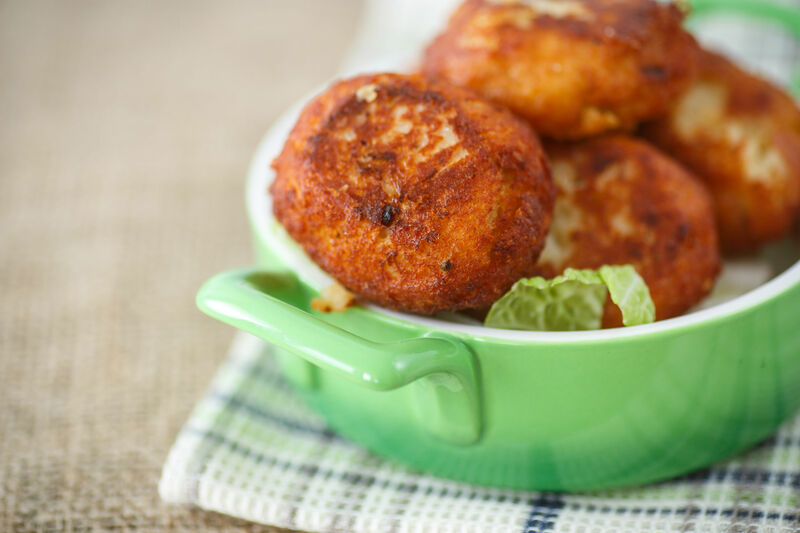 Unlike Any You’ve Had Before, These Fried Meatballs Will Blow You Away! When it comes to meatballs, we’re pretty particular about how we like them, but this recipe just goes to show how great it is when you switch things up every once in awhile. Not only did we choose to make these chicken and pork meatballs, but we also added ricotta cheese to keep them perfectly tender and prevent them from drying out. After baking these bad boys, we quickly rolled them in a deliciously seasoned panko mixture and pan fried them for ultimate crispiness. The result is a flavorful meatball that’s light and crispy on the outside, while perfectly cooked and moist on the inside. We like to serve up several of these as a main course, but you could also stick a toothpick in them and serve them at a cocktail party or as a tasty appetizer. Either way, change things up and try these out…you won’t regret it! Combine chicken, pork, 3/4 cup panko, 1/4 cup parmesan, ricotta, garlic, 1 egg, rosemary, salt and pepper in a large bowl and use your hands or two forks to mix together. Roll mixture into 1-inch balls and transfer to 1-2 baking sheets. Place in oven and bake for 20-25 minutes, or until inside is almost cooked all the way through, but still a little pink. Set up an assembly line by your work station with flour in one dish, remaining egg lightly beaten in another, and remaining panko, parmesan, paprika and cayenne in a third. Fill a large pot or Dutch oven with 1/2-1 inch of vegetable and cook over medium-high heat until oil is shimmering and sizzle when you drop a pinch of breadcrumbs in. Take each meatball and roll it in flour. Shake off excess and submerge in egg wash, then drip off excess and roll completely in seasoned breadcrumb mixture. Working in batches, carefully drop 3-5 meatballs in oil and cook until browned and crispy on all sides. Use a slotted spoon to remove meatballs and transfer them to a paper towel-lined plate. Repeat with remaining meatballs, then serve immediately.